I recently re-read a study out of the University of Florida that concluded that, despite the addition of topical scent solutions, the infusion of scents or the addition of salt, the singularly most influencial factor on bass striking was "movement". In this study bass would hit both dead and living shrimp while drifting to the bottom but once on the bottom they completely ignored the stationary shrimp. It was the movement of the food, not how it smelled or sounded, that determined the strike. How does this study's conclusions pertain to a jerkbait rod? 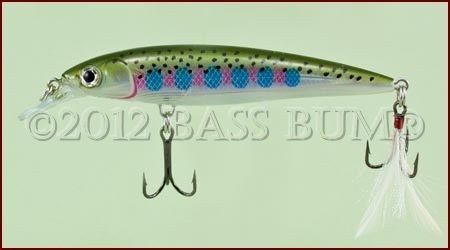 Among hardbait lures, a jerkbait, even if a soft version, is unique in that with a jerkbait lure the angler and his or her rod must impart lure action. Bass are drawn to movement and a jerkbait, properly fished, has tons of that. Jerkbaits, being minnow like lures with usually long, slender shapes, can be very effective when worked with skill that produces fast, erratic and attention getting action. So if action is the key, one important ingredient in effective jerkbait fishing is the rod. For it is the rod in the hands of an angler that impart action to the lure. What is the best rod type for acheiving this action? As with most things in bass fishing there are many opinions. What follows are mine. Others will have different opinions based on their personal experiences and skill level. There are hard and soft jerkbaits. Besides the obvious differences, hard versus soft, diving bill versus no bill, there is also the fact that hard jerkbaits have multiple treble hooks while soft jerkbaits have a single hook, usually an offset worm hook. Soft jerkbaits are sometimes weighted, sometimes not, and more often than hard jerkbaits, are fished where hard versions would get hung up by their multiple treble hooks. If you've been a regular reader of this site you know I don't lock myself into any technique or rig. I try everything. Experimentation is an important part of learning and growth as an angler. For me, a baitcast rod or spinning rod work well with hard jerkbaits. A baitcaster for soft jerkbaits, not so much. When I use a baitcast rod and reel to fish hard body jerkbaits, because I'm no baitcast reel expert, I often, though not always, use the a Shimano Calais 201DC which has a computer chip that regulates the spin of the spool compensating for wind, fat thumb, clumsiness. In short, my lack of skill. If you've been a regular reader of this site you know I don't lock myself into any technique or rig. I try everything. Experimentation is an important part of learning and growth as an angler. For me, a baitcast rod or spinning rod work well with hard jerkbaits. A baitcaster for soft jerkbaits, not so much. When I use a baitcast rod and reel to fish hard body jerkbaits, because I'm no baitcast reel expert, I often, though not always, use the a Shimano Calais 201DC which has a computer chip that regulates the spin of the spool compensating for wind, fat thumb, clumsiness. In short, my lack of skill. I pair this reel with a Shimano Compre 6' 6" medium action, medium tip baitcast rod. The medium tip helps me prevent ripping out the treble hooks of hardbody jerkbaits. This combination provides me a jerkbait rod with which I can make long or short casts and enables me to impart enticing, erratic or sliding motion. More accurate casts can be made with a short spinning rod and skipping under docks is abundantly easier with a short rod. In these situations my line choice is monofilament or fluorocarbon, no braid. Additionally, when I retrieve jerkbaits, hard or soft, I snap my rod tip down toward the water so a shorter rod is less likely to contact the water. The rig I find myself using more than any other for 4" and 5" soft and hard jerkbaits is what is shown above. A G. Loomis 6'3" Bronzeback, SMR752S-SP. A long spinning rod and reel setup provides for longer casts and when rigged with braided line provides for better snap hooksets at long distances. I've found this to be a better alternative when chasing smallmouth. They're usually in clear water and very aware. Long casts that can be made with spinning gear, braided line (10lb Fireline Crystal) with a 4-6' monofilament leader (10lb Berkley Sensation) to provide a little stretch and a lightly weighted hook help even the odds between me and the smallmouth. Get yourself a rod, spinning or baitcasting, that enables you to get proficient working a jerkbait and you will increase the number of bass you catch. But it takes practice and the appropriate rod to impart action to jerkbait lures that will draw bass from both shallow and deep water.